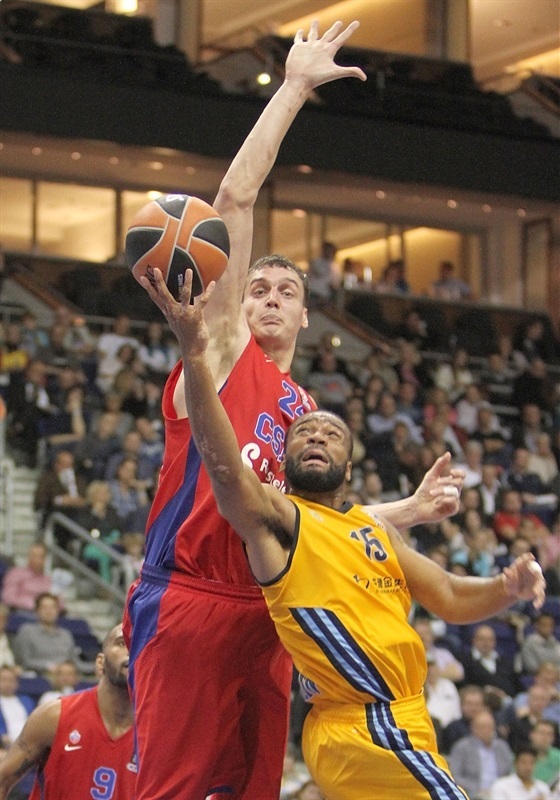 CSKA Moscow hit the ground running under new head coach Dimitris Itoudis with a no-doubt-about-it 68-84 victory Friday on the road against ALBA Berlin in Group B. CSKA's depth was apparent with six double-figure scorers led by Sasha Kaun with 16 points and 9 rebounds. 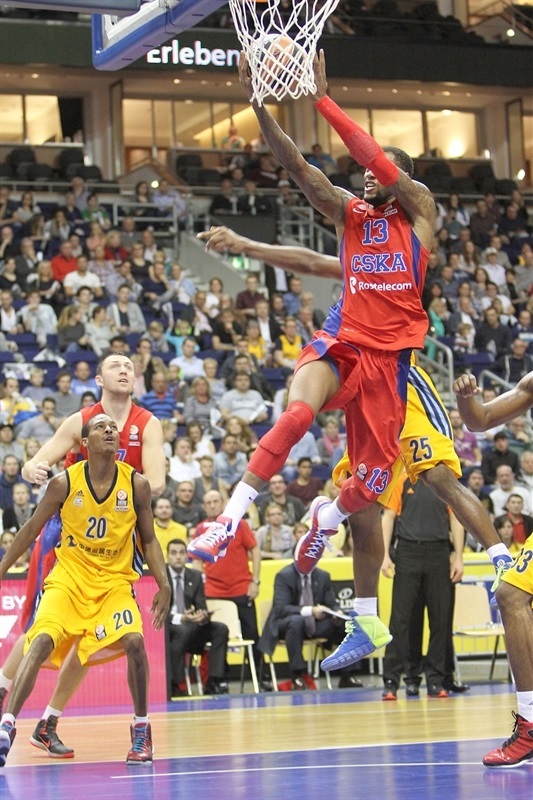 Milos Teodosic and Sonny Weems added 15 points each. 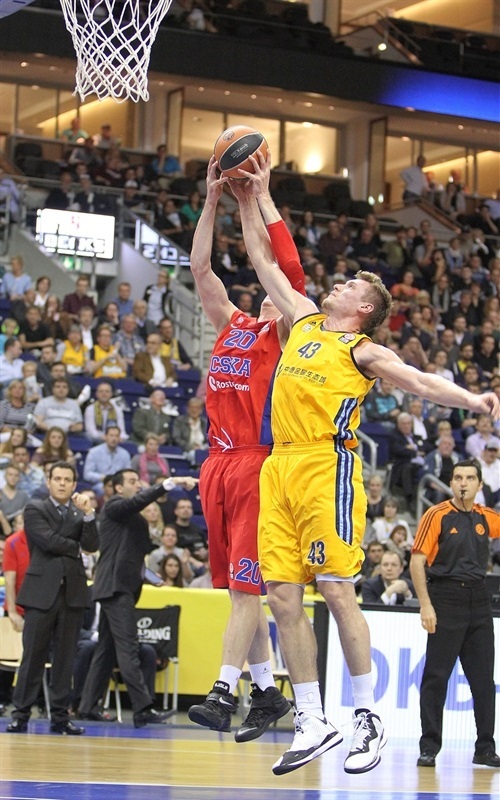 Vitaly Fridzon, Aaron Jackson and Andrey Vorontsevich contributed 10 points apiece. CSKA led by 9 in the first quarter before ALBA came back to tie early in the second, but from that point forward the visitors pushed ahead more and more and never lost control of the scoreboard thanks to consistently strong defense. For ALBA, Reggie Redding was the only double-digit scorer, with 11 points, while Niels Giffey and Jamel McLean had 9 each in their Euroleague debuts. Kaun downed identical baseline hook shots around free throws by Alex King for a quick 2-4 CSKA lead. Vorontsevich and Jackson joined the CSKA scoring for a 2-8 lead before Redding canned his first basket and fed King for a second-chance dunk. Fridzon scored on a reverse for CSKA but Leon Radosevic matched him with a baseline jumper to get ALBA within 8-11 before the first timeout. 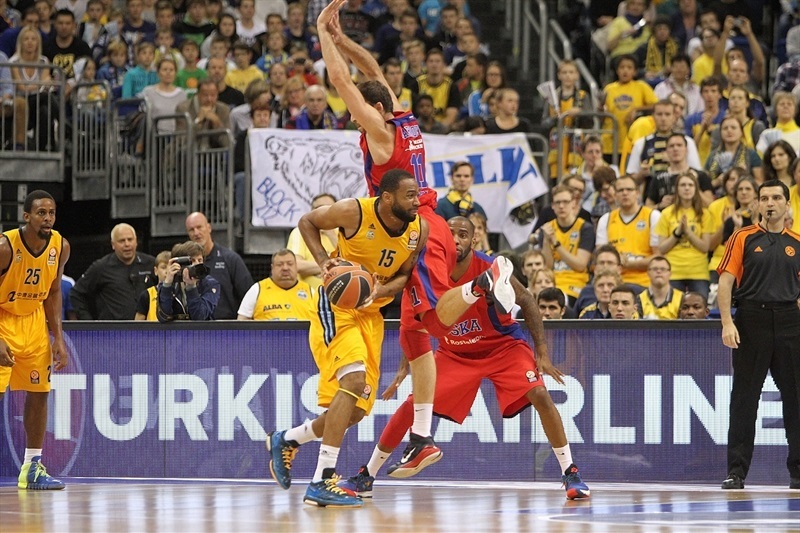 Fridzon fired in the game's first three-pointer from the corner and Weems came in to make his first shot as CSKA's lead climbed. When Teodosic, also off the bench, drilled a triple, it was 10-19. Kyle Hines added his name to CSKA's scoring list before Redding hit ALBA's first shot from the arc and Marko Banic put back an offensive rebound, still the visitors held a 17-21 advantage after 10 minutes. Alex Renfroe and Giffey came off ALBA's bench to hit two-pointers and tie the score 21-21 to start the second quarter. 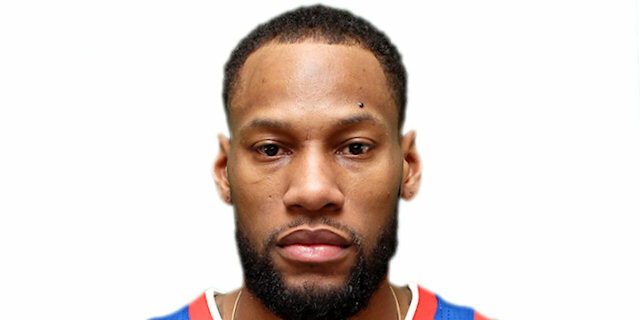 Free throws by Jackson and Weems reestablished CSKA's lead. Renfroe's step-back jumper got ALBA within 23-25 but Weems answered with a sweet drive. When Fridzon struck again from the corner on a broken play, Akeem Vargas matched him to make it 26-30. Renfroe broke away for a layup to bring ALBA closer, but Kaun reemerged then with a three-point play and another tough inside basket to give CSKA breathing room again at 29-37. 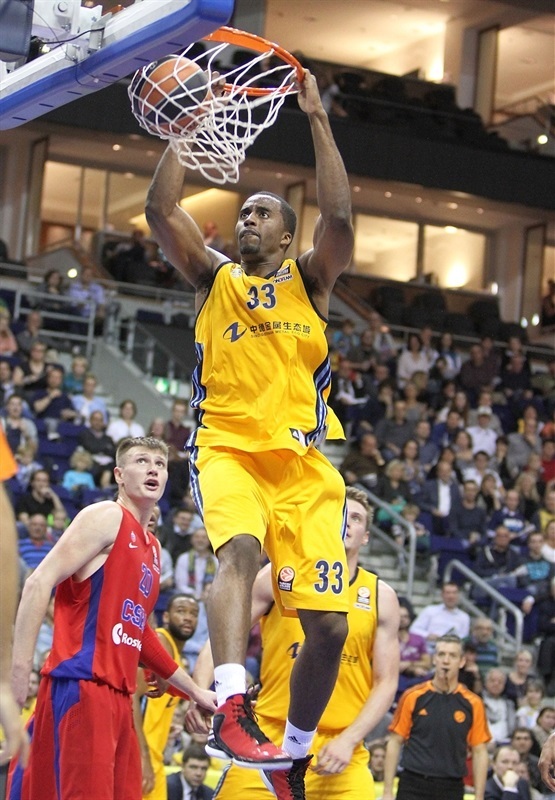 A smashing dunk by Weems was worth the same points as Banic scoring alone for ALBA before McLean's free throws made it 33-39. Despite a put-back by McLean, Teodosic answered from downtown and the free throw line as CSKA matched its high lead, 35-44. That's when Redding appeared and beat the halftime buzzer from three-point distance to cut the difference to 6 points, 38-44. Vorontsevich blasted a triple, Kaun detonated a dunk and Jackson and Teodosic hit layups as CSKA came out for the second half and soared to its biggest lead yet, 38-51. Despite ALBA restarting its offense through Giffey and Cliff Hammonds, another triple by Teodosic kept CSKA comfortable at 44-56. Kaun registered another basket and a block to raise the difference. Radosevic and Vorontsevich traded free throws and Banic returned to cut the difference for ALBA to 50-62 after three quarters. 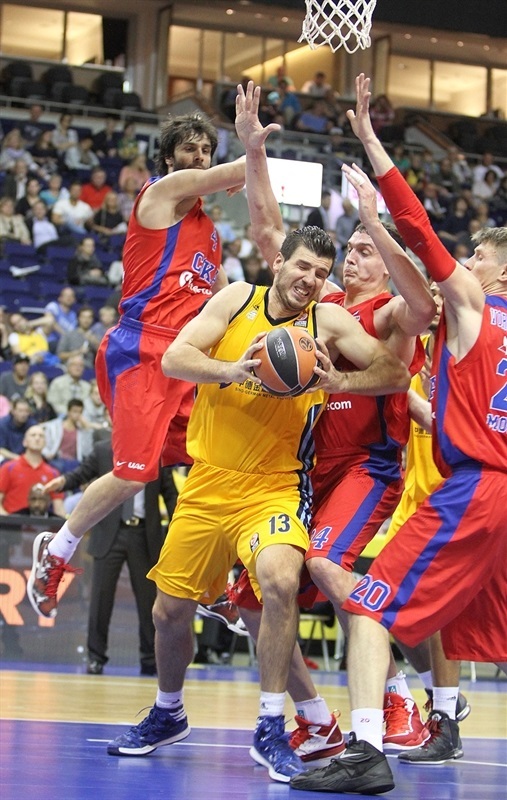 Radosevic started the fourth-quarter scoring inside for ALBA and Weems responded with a transition jumper. 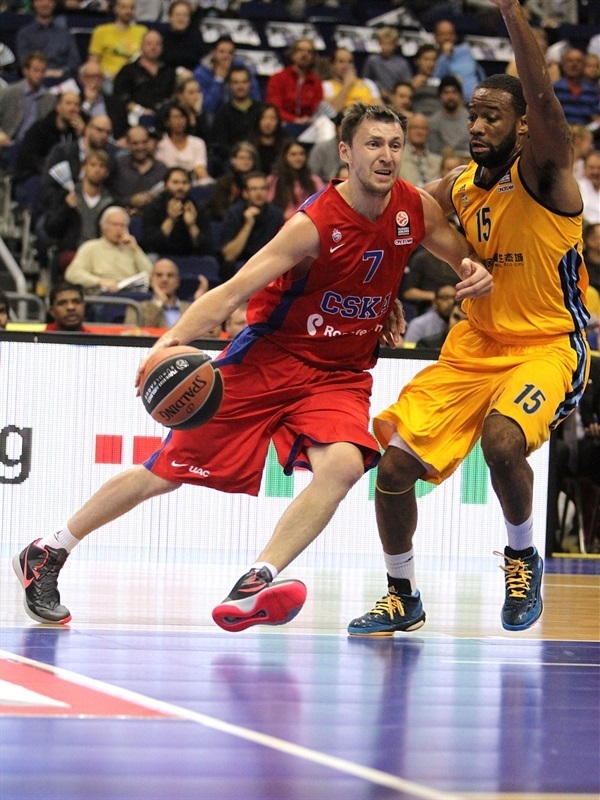 When Fridzon fed Vorontsevich for a wide-open triple, CSKA was completely in charge again, 52-67. Hammonds and Weems traded three-pointers next, and while ALBA got inside scoring from Radosevic and Banic, Hines flushed a dunk and scored a second-chance basket to keep CSKA safe before Jackson drove for another big lead, 60-76. A tip-in by Hines and a dunk by Kaun were followed by Teodosic hitting a baseline jumper at 65-82 as CSKA succeeded in wearing down ALBA to seize a good-as-gold road win. 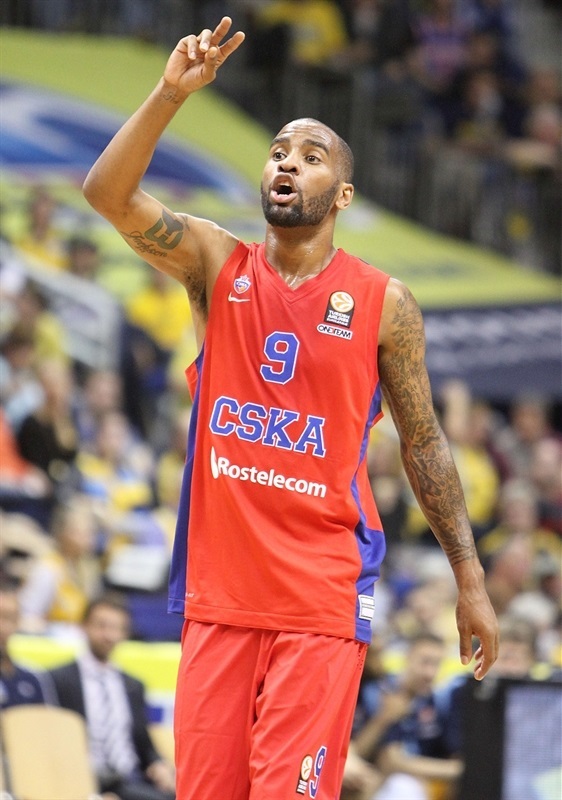 "CSKA is absolutely the deserving winner tonight. They are one of the best teams in Europe and from the beginning were in control. On offense, we didn't have the necessary self-confidence and then that transferred to our defense. We need to check off this defeat quickly and simultaneously take a lesson from it and keep our feet on the ground." "Congratulations to my team for the win and a good game. I think we controlled the game from the beginning till the end, we executed our strategic plan and played focused. We faced a team that is very aggressive both offensively and defensively, which already won its first title by defeating Bayern in the German Supercup, which is still unbeaten in its domestic league. There were some difficult moments when Alba stretched our defense, when it denied the passes to our creators. In the first half we had problems with offensive rebounds, but we corrected the numbers after the break and I am glad that we fought on the boards whether playing big or small." 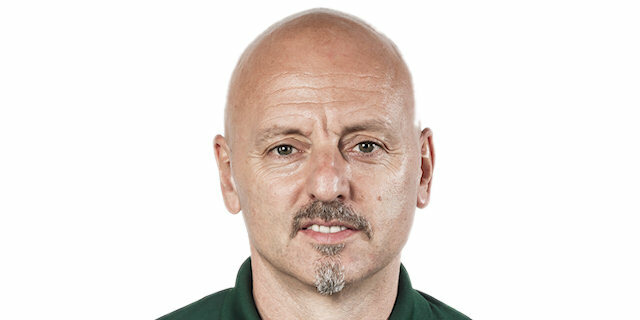 "We tried our best to compete against one of Europe's elite teams. They played very physically and gave us no easy baskets. In key moments they were one tenth of a second faster than we were. But we know we can do better. 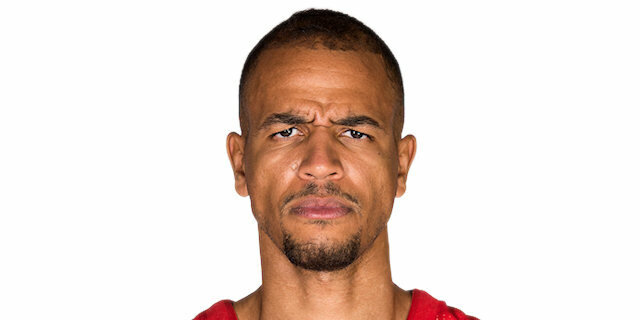 We will analyze the game and come back strong with better defense and team play." "We expected a hard game. ALBA is a great defensive team. We tried to match their intensity on the defensive end and we're happy to come away with the win. CSKA has to get ready for a tough season, with a new system, new coach, new players, but if we play the way we can play, we can go far."